Today after receiving a macOS Mojave update notification, I tried to install the latest OS for Mac. Firstly I didn’t found the option to update mac os Sierra to Mojave in the software update page. I already posted a tutorial about Macbook Updates not showing macOS Mojave and its solution. Right after fixing that issue, Mac started updating the OS to Mojave. But in between, I received “An Error Occurred Validating the installer data. The download is either damaged or incomplete. Redownload the installer and try again“. I tried installing the OS 3 times but every time, it got stuck before 7-9 minutes remaining to finish the installation. How to solve An Error Occurred Validating the installer data during macOS Mojave installation? After receiving the error message, I started searching on the internet for various solutions. I read almost all solutions mentioned in Apple forum, Reddit, and other forums related to Apple. But none of the tips worked for me. Finally, after performing the below-mentioned steps, macOS Mojave successfully finished installing on my MacBook Air. 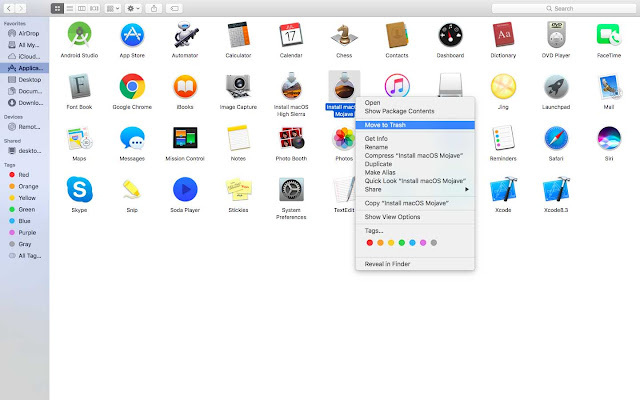 Step 1:- Go to Application folder on your Mac. Step 2:- Since you have tried installing macOS Mojave, Mojave installer will be there inside the application folder. First of all, we need to remove the existing installer. Step 3:- Right Click on the installer icon and Move it to trash. Step 3:- It will ask you to type your Mac password again. Type the password and press OK button. This will remove Mojave installer from your Mac. Step 4:- Now go to App Store and go to the homepage. (Featured Section). Step 5:- There you can see the option to download Mojave. In my case, I left the home during the downloading and when I return, Mac was running the installation automatically. I waited nearly 30 minutes to finish the installation. What Other Forum users telling about “Redownload the installer and try again” error message? As I told above, I read many forum posts about this issue and there were many recommendations. Unfortunately, none of them worked for me but for others, it was the right solution. So, if the above fix (which worked for me) didn’t fix yours, please try the following tips. This was one of the tips most users found working. Restart your Mac and run the installer. 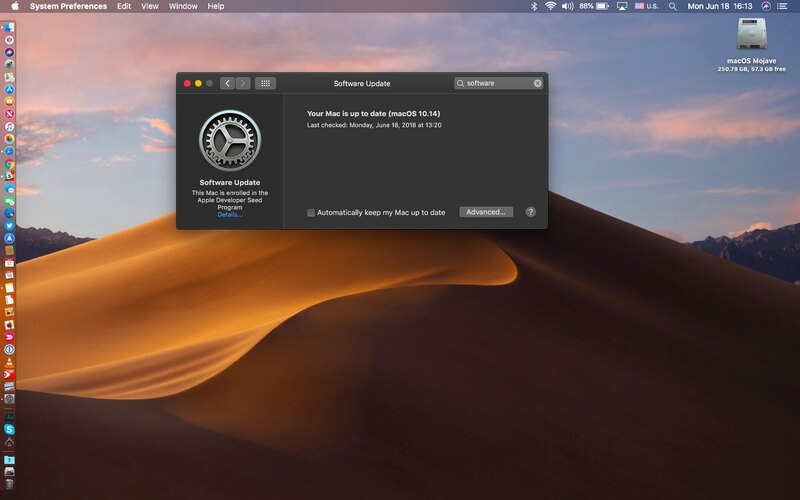 This may fix all errors during Mojave update and help you to migrate from Sierra. Some users found changing your existing WiFi connection will fix this issue. One user mentioned that, he turns off his WiFi and connects with a 4G USB dongle. At that time, the system didn’t show ” An Error Occurred Validating the installer data” error and he successfully finished the installation. A couple of users mentioned that this method worked for them. Firstly, you need to create another user account by providing the admin privilege. After that, Sign out from the existing account and Log in to the newly created admin account. Now from there, try running the installer. As per his tip, the installation will successfully complete and you will be able to login to your newly created admin account. Sign out from there and log in to your old account. From there you can remove the newly created admin account. A few users mentioned that the error was solved after Disabling Automatic Proxy Configuration and Auto proxy discovery. By default both this will be in disable mode and you need to perform this step only if you changed it before. Select your connected network and click on the Advanced option on the bottom left corner. From the list click on Proxies and Disable (Untick) Automatic Proxy Configuration and Auto proxy discovery. However, I am not sure about any of these tips. You can try all of them and check what tip worked for you. 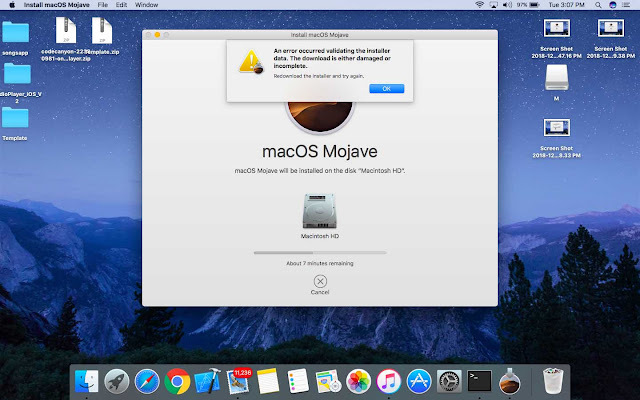 During the installation procedure of macOS Mojave, many users got “An Error Occurred Validating the installer data. The download is either damage or incomplete. Redownload the installer and try again” error message. I also received the same message and reinstalling Mojave installer fixed my issue. I know you all have a different opinion and ideas. Please comment it below so that it will be helpful for other users.